If prelude is prophetic, then the next A Sound of Thunder full-length album, Time's Arrow, is going to be a heavy metal monster. 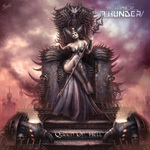 The prelude is a four song EP called Queen of Hell, and ASoT is ripping it up big time. A Sound of Thunder:: back in black, again. The title tune, Queen of Hell, comes in two editions, both are massive arrangements that move with breathtaking speed with big riffs and epic solos. The 'album version' is the longer of the two, having more prelude before kicking out the jams. The latter version features Veronica Freeman of Benedictum tying one on in duet with ASoT's Nina Osegueda. You don't want to get between these two gals; by vocal skills alone they can burn most ordinary metal bands to the ground. In between you have another new song, Hello Nurse, and a cover a Black Sabbath song, Trashed. 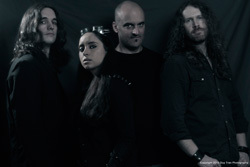 The former offers Osegueda's clever lyrics in another melodic metal number with a strong rock groove. Yet, the most interesting part may be the rollicking, near blues or swing, piano from jazz musician Loston Harris. (Read more below from guitarist Josh Schwartz about the song). To the latter, ASoT reaches back to an odd period and often dismissed album by Black Sabbath, Born Again with Ian Gillan (Deep Purple) in a one off performance. Trashed not only gets new life breathed into it, but also some frenetic intensity. Bottom line: scoop up this little EP, dig some more A Sound of the Thunder, and buckle for Time's Arrow. Josh Schwartz on the sound of Hello Nurse: I wrote the music. The original idea was to have a really heavy classic metal intro, and then kind of do a fade out and go into something with kind of a swing feel. I'd credit Helloween for inspiration of that basic idea and the playfulness of the whole thing, and I'd credit Motorhead for musical inspiration of the verses, which have a similar rhythm and feel to "Damage Case". Once we had written the music, the piano solo just suggested itself. One last bit of credit to Deep Purple for the piano and guitar trading licks at the end of the solo section! I've been calling this song a "rock and roll sandwich with metal bread", referring to the heavy intro/outro sections as the "bread"!